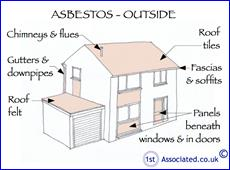 I found their website particularly useful in helping me to identify the type of survey I required, a rough guide to the cost, the benefits of having a survey done and amongst other good information, an example of a surveyor’s report: http://www.1stassociated.co.uk/default.asp. My initial contact with the company found the service to be efficient and friendly. On the day of the survey, about an hour before the surveyor was due to arrive, he called to say he was running a little late. I actually appreciated being kept informed because in the past I have had to contact organisations to try and find out why people haven’t turned up! For me, going through this process was quite scary... it’s the fear of the outcome! By nature, I’m quite proactive and would rather anticipate problems and minimise the risks of problems occurring in the future, but this survey thing took some guts!!! Anyway, on a previous post titled; Hmmm... will the house fall down?, I have provided a brief overview of the surveyor’s visit. Now I am just going to comment on the report (I received an electronic copy this morning and a hard copy along with a disc of photos, is in the post). I did mention to the surveyor that I found it a little confusing when doing some initial online research on the company that 2 names were involved (Gem Associates and 1st Associated). Anyway, there appeared to be a logical reason for this (1stAssociated.co.uk are the marketig company and Gem Associates are the actual surveying company). Back to the report... if it hadn’t been about my house, I would have enjoyed reading it! Seeing the problems recorded in black and white is far more daunting than discussing them face to face with the surveyor on the day! The report included a sort of idiots’ guide to the technical terms used, which was really appreciated. In fact, the entire report was pitched at the right level (I hate it when professionals attempt to blind Joe Bloggs with terminology... I think it demonstrates the poor communication skills of the professional). Whilst it isn’t great to get a list advising of the maintenance / repair jobs needing to be done, the whole point of the survey was to obtain this constructive advice! I liked the way that each ‘job’ was titled and supported by a photo of the problem area. This was followed by an explanation of the specific action required and estimated cost... both will be invaluable when getting quotes. For example, there is a part of my roof which needs some attention next summer... the area is approximately 3’ square. 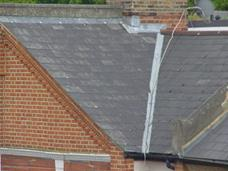 Without the report, a roofer may have been able to persuade me that a much larger repair job is required. Then of course I have to consider what future problems may have occurred had the surveyor not brought the matter to my attention. This is an example of where I feel the survey provides excellent value for money. During the surveyor’s visit he gave me a checklist to complete. In fact, when you have someone like myself, who has quite a poor knowledge and understanding of most things pertinent to the survey, it probably would have been advantageous to have been issued with a checklist prior to the visit, steering me from room to room. There was something additional that I would have liked to have discussed with him, but had completely forgotten about it on the day... this is where an earlier receipt of a checklist might have helped. Saying this, you get a great sense of the ‘after care’ available from the company. For example, the email received from them today invited me to contact them if I need any clarification or assistance to understand any part of the report. They also provide support, if requested, when dealing with the actions required (but I don’t know the additional costs). Most importantly, I don’t feel as though I have been left high and dry! It was very fortunate for me that the surveyor has a specialised knowledge and interest in period properties. To be honest, he helped me to be less fearful of my house and by the time he left, I actually liked my home again (I think I was unnecessarily stressed by fear of the unknown). He was also able to recommend organisations / websites which could provide useful information regarding older properties / listed buildings. The report wasn’t just about matters that required attention, it also provided information about the general structure of the property. The surveyor hadincluded diagrams to aid my understanding... so this whole event has been quite an education! Just a handful of positive comments had been recorded (probably to prevent me from packing my bags and selling up),along with some snippets of what was going on in England at the time the property was built. I had a full building survey done when I first purchased this property 8 years ago. The detail provided in that survey report was full of jargon and contained only about 20% of what I received this time round. So... I would say that my experience of this company was a positive one! Our client had analysed the market in the area with regard to prices in some detail and was particularly interested in the square metre rate. 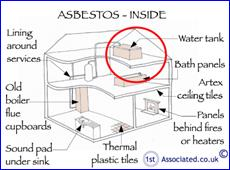 This is something that we rarely come across in the residential market unless it is a chartered surveyor buying the property and yes we do carry out surveys for surveyors. However with floor plans being very commonly included as part of the house property details in some areas of the country it has become easier and easier to analyse a property on a square metre rate. We would recommend that you work out the square metre rate of your existing property and in each of the rooms; it doesn't take five minutes to measure them. To make it easier there are even various laser measuring devices such as Leica Distos, Makita, Bosch and Stabila and all other good makes. Once you understand the dimensions of your own property you can then decide whether a bedroom or a lounge is small in comparison with your own property or in comparison with your views on what is large or small with regards to lounges and bedrooms and kitchens and bathrooms, etc. It was also interesting with this particular client that they were well aware that this square metre size building should have a utility room and en-suites which is why they were looking to add these additional rooms. 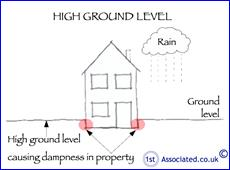 For many years it has been normal practice within surveying to use square foot and/or square metre prices in relation to commercial valuations therefore we are very familiar with the use of square foot and square metre rates when comparing commercial properties which is a good system where there are few comparables. 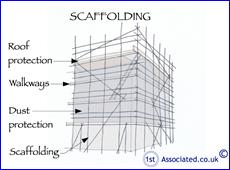 As a basic way of looking at different properties a square metre rate can work very well but the danger of analysing house prices by square metre rate alone is that it does not allow for other factors which in this case was major maintenance costs on the property at high level which would mean that scaffolding was required which in itself can be very expensive. There are also other important factors such as kerb appeal which is the look of a building. This can add considerably to the value of it and of course the internal fixtures and fittings. We recently dealt with one property where the purchaser was really buying it on the internal fixtures and fittings and when we went through the property report which highlighted problems with the property they decided not to buy it. Of course the location of a property can be key to its value in particular its proximity to good schools, shops, good view, etc. Even streets can have a good end and a not so good end which affects the value. Why doesn't square foot or square metres work in houses and homes every time? 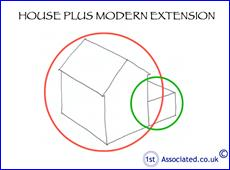 It is not strictly true that it doesn't work every time but it needs to be used with an understanding of other factors, a few of which we have mentioned above, and not looking purely at square footage or square metre rates. We would always recommend if you have the time and can get to the property whilst the survey is being carried out that you meet your independent surveyor who will be more than happy to talk to you about any concerns and possible problems that you think the property may have. We will, of course, be happy to speak to you about the survey report once it has been completed. Always have an independent building survey as this will highlight any property problems. Caveat emptor means buyer beware and is why you need to have a building survey to find out if there are any problems within the property; the estate agent certainly will not advise you of any. We would reiterate that we highly recommend you always make sure when you have a survey if at all possible you should meet your Surveyor at the property. Please feel free to have a look at our website 1stAssociated.co.uk to see for yourself the quality of our website, articles and Building Survey reports. We pride ourselves on our professional standard and easy to read reports written in plain English which we have been carrying out for many years on every era, type and style of property across the UK. Review from a client who bought a boat and it sank and who wasn't going to buy a house and have the same thing happen! Why should you have a Building Survey carried out? The client that we recently carried out a survey for was looking to buy a period property and interestingly they advised us that they would always have a building survey carried out because of a past bad experience. They had previously purchased a boat of which they thought they had a lot of knowledge of but the worst happened and the boat sank. The client advised that because of this they would certainly not risk buying a property without having an Independent Building Survey carried out. Estate Agents can be very persuasive! Another interesting comment that the client made was that the Estate agent tried to persuade them to use one of their own Surveyors, why would anyone want to do that? We always enjoy meeting our clients at the survey whenever possible as we are able to talk about any plans they may have to alter and amend the property and also to advise on how to solve any problems that we come across. In this case we were really pleased that we did get to personally meet the client at the property especially as we knew they had to travel quite a distance as the property was in a completely different county to where they were currently living. The property was an older cottage style located in the middle of nowhere and it had been lived in for many years without much maintenance being carried out. Interestingly modern additions had been added such as a conservatory style extension or a garden room as they are often known and also a relatively new kitchen. 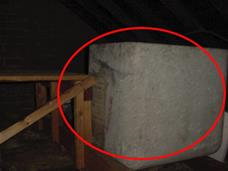 The roof had also had a lot of insulation added (probably too much). We noted during the course of the survey that the house still had some of its beautiful old features such as a flint wall. 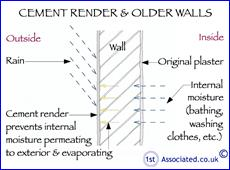 Sadly some of these features had been repaired quite badly using modern methods by tradesmen that were not experienced with dealing with older style properties and who did not understand how to repair them, for example, the flint wall had been re-pointed in cement mortar instead of lime. Most of the property had been rendered in a cement render rather than a lime based render. The cement render is simply too hard for an older structure such as this and has resulted in cracks to the render. 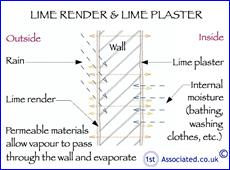 We advised our client that ideally it should be re-rendered in a lime mortar. 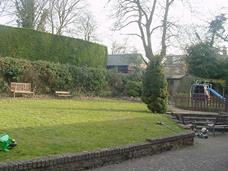 The property appeared to have a lot of potential and this was of most interest to the client. 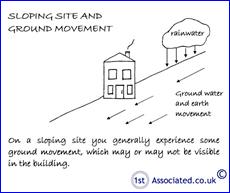 However when the house had been surveyed several problems were discovered such as dampness, we believe, from being situated on a sloping site and a high ground level. We noted that the electrics were also dated and that heating was via old electric heaters. The client thought that the property would be a good refurbishment project to undertake but was concerned about the roof. 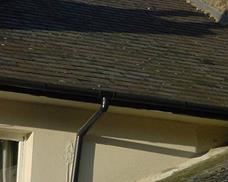 He informed us that he had already obtained quotes from builders from a nearby property that was being refurbished. However after we had inspected the roof we could only see minor problems with it and it certainly did not need to be re-roofed in a modern roofing material when the existing slates could be reused. This information saved our client a lot of money. We would always recommend re-using these older slates over modern, cheaper roof slates that we do not have much experience with in this country. During the survey we also identified that there was a lack of available parking to the property. All the parking space available belonged to neighbouring properties that seemed to be quite territorial about it. We informed the client that this possible dispute between neighbours and the lack of parking could seriously affect the value of the property when it came to selling it and it would also limit the potential buying market. 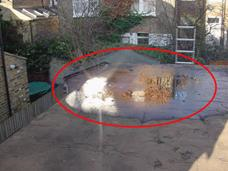 We would have preferred to see a fall of twelve to fifteen degrees to the flat roof over the conservatory as the condition of the felt indicated that water was sitting on the roof, this is known as ponding. We discussed design alterations with the client that would improve the property including adding a pitched roof to the conservatory. Caveat emptor means buyer beware and is why you need to have a building survey to find out if there are any problems within the property; the estate agent certainly will not advise you of any problems. The Estate Agent has been commissioned to sell the house, nothing more and nothing less. We always include many photos within our reports. 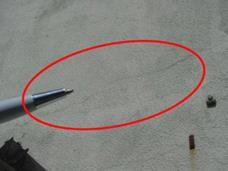 Sometimes where there is a problem in the property that we wish to emphasize or highlight we will use circles or ovals to identify this, please see the photo and sketch below If the report, along with our photos, does not explain the problem or characteristics of a property enough then we also have a vast range of sketches that we have had commissioned exclusively for us that we can use in our reports. We are experienced independent building Surveyors who are knowledgeable in carrying out structural surveys on all types, styles and eras of buildings. If you are looking to buy a property it makes sense to have a structural survey carried out by an Independent Surveyor. Phone us for a friendly chat on 0800 298 5424.